For the intelligence officer of the 41st Infantry Battalion – Lieutenant Frederick (’Eric’) William MacGibbon – nights on the front line in France and Belgium were usually a potentially deadly venture across to the German lines with a raiding party, hoping for an intelligence dividend from seizing documents and prisoners. Subsequent analysis then had to be passed to relevant units as speedily as possible. This led to him being Mentioned in Despatches in May 1918 and, particularly for his actions in the period August to October 1918, the award of the Military Cross. The recommendation for the latter award spoke of ‘his personal daring reconnaissance and thorough organisation’ and that his work ‘has been of the utmost importance and at all times he has carried out his duties with keenness, ability and thoroughness’. Eric - called that to distinguish him from his Glasgow-born father Frederick Whitehouse MacGibbon, the Queensland manager of Arthur and Co, a Glasgow manufacturer and exporter to Australia - was born in West End, Brisbane on 17 January 1891. His mother was Elizabeth Browning nee McClew, also born in Scotland. The MacGibbons were members of the congregation at Saint Andrew’s Church in Ann Street, Brisbane. Eric attended Brisbane Grammar School (BGS) where he made a firm friendship with fellow student Errol Solomon Meyers. Later Meyers was the highly regarded medical officer for the 41st Battalion in which MacGibbon served, and the two always billeted together in Belgium and France. Meyers went on after the War to have a distinguished career as a surgeon, medical educator and a founder of the medical faculty at the University of Queensland. After finishing at BGS, Eric MacGibbon worked with the New Zealand Insurance Company Ltd but resigned after three and a half years to tackle the arduous work of clearing land and planting sugar cane near Proserpine. Financial obligations from this frustrated a keenness to enlist for full-time service in the AIF at the start of the War, and he regretted not being able to go to Gallipoli with his contemporaries. 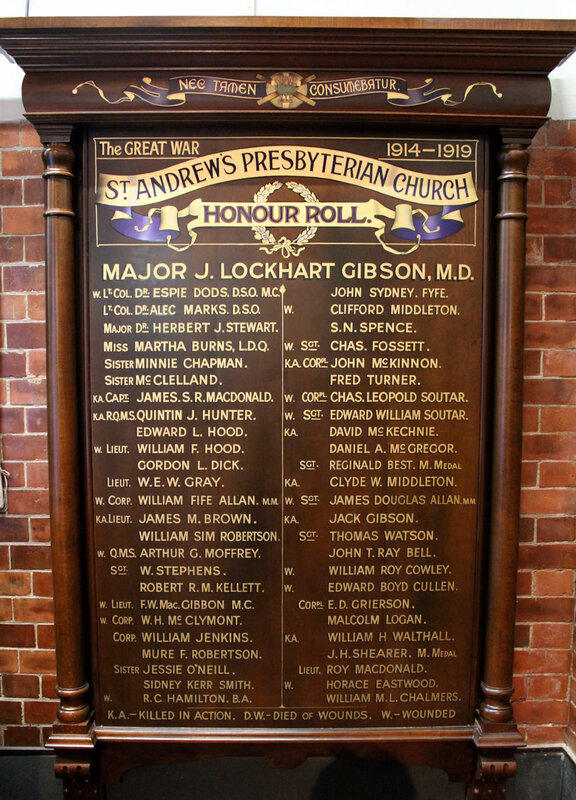 Some 174 former students from BGS served at Gallipoli - with 28 dying there, as well as two masters. On 1 August 1915 Eric was appointed a Lieutenant in the militia with the 27th Light Horse (North Queensland) Regiment, having been a senior cadet for four years. At this time he was 5’11” (180 cm) tall, weighed 145lbs (65.8 kg), and had a dark complexion, dark hair and blue eyes. Finally able to join the AIF full-time on 1 October 1916 (as a 2nd Lieutenant), he embarked on the Demosthenes, arriving in the UK in March 1917. Meanwhile Eric’s older brother – John (‘Jack’) McClew MacGibbon (1887-1977) - took a different path in serving. After attending BGS and matriculating, Jack worked as an industrial chemist, and in 1916 was one of a number of Australian chemists recruited by the UK Ministry of Munitions. Jack worked at the large munitions factory at Queen’s Ferry (near Chester in the UK) where he became the Chief Laboratory Chemist. In May 1917 Eric MacGibbon arrived in France in the 6th reinforcement for the 41st Battalion. The 41st was in the fray at Messines in early June and then in late June and early July, as part of the 11th Brigade, was under heavy and sustained fire of all kinds in what was called ‘the Eighteen Days’, as they built a new trench system near Warneton in full view of the Germans. Brigade casualties were significant and Eric was wounded twice during this period. On the second occasion - on 7 July 1917 - a German shell burst in the mess of the 41st, killing one officer and wounding several others, one of whom was Eric. Remarkably, he returned to duty after only three weeks. The 41st remained in Belgium for the rest of 1917, and Eric saw battles such as the slaughter in the 3rd Battle of Ypres (the ‘Passchendaele Offensive’), when in his words ‘the dead of both sides lay so thick for some miles in depth that it was impossible to avoid walking on them’. The German Army’s last major offensive was in March 1918 and the 41st was among the units rushed south to France to help blunt the German push towards Amiens. On 21 April 1918 the German flying ace called the ‘Red Baron’ (Captain Baron von Richthofen) was shot down near the trenches occupied by the 41st, and numerous souvenirs were taken from his plane. Eric ensured that one of these – the liquid compass from the plane – was delivered to the Australian War Records Section, and it is now among the holdings of the Australian War Memorial in Canberra. ‘Looking back to Hamel as far as the eye could reach, in lines of sections in single file, the battalions moved forward, with sections of Machine Gunners and trench mortars with their weapons, while dotted here and there were lumbering tanks, artillery teams with guns, Engineers with all their paraphernalia, balloons being towed by lorries, pack mules, wagons, horsemen and laden lorries, a vast multitude each ready to do their allotted task’. ‘I have been present at conferences and the General would listen and consider any suggestion put up, irrespective of the speaker’s junior rank’. Bean’s Official History mentions three incidents in which Eric was involved during the August 1918 attack and subsequent advance to breach the Hindenburg Line. The first was on 10 August when Eric and two others investigated a suspicious sound on the Somme slope, exchanged bombs with a group of Germans and after ‘a sharp tussle those Germans left surrendered, and the two officers marched them up the hill to the outposts’. Two days later Eric helped guide a company of the 43rd Battalion through heavy shelling to extend the flank, while on 1 September 1918 MacGibbon is noted as having sent accurate news quickly from the front at Mont St Quentin. While waiting for repatriation to Australia, AIF Battalions were asked to submit narrative accounts of their service 1916-18. Eric’s account of the 41st was very well received and was published in book form with the title 'The Forty First'. A notable feature in his writing was that while not downplaying the horrors, hardships and sacrifices, he also referred to the humour that the men displayed, even in the worst of conditions. He achieved his aim of producing a readable account and a wry sense of humour could also flow from his pen. Eric returned to Australia on the Kanowa in late 1919, carrying out the role of Adjutant on board. On berthing his duties included plying the Customs officials with generous hospitality so that the men on board could land various mementoes and trophies without question. Eric’s commission was formally terminated on 20 March 1920. Initially he purchased a pearling lugger and tried his hand at that off the coast of New Guinea and the Barrier Reef, but success was limited and he then resumed sugar cane farming for eight years. Having attained the necessary qualifications, he subsequently worked as an accountant and company secretary in Townsville in the local office of the Commercial Union Assurance Company Ltd, in Brisbane with the Nestle-Anglo Swiss Condensed Milk Company Ltd, and in Maryborough with the timber company Hyne and Son Pty Ltd. He maintained a strong commitment to and involvement in Legacy, and was regarded as a quiet and thoughtful man. Eric’s brother Jack became the inspector for the Central Cane Prices Board 1921-23, and then the chemist member on the Board for 30 years (ten consecutive terms of three years, 1924-1954). He was also an active member of the Queensland Society of Sugar Cane Technologists - serving in the roles of Hon Secretary 1932-41, member of the publications/editorial committee 1932-48, and Vice-President 1942-48. Jack later worked as a technical adviser to the Proprietary Millers Association for several years before finally retiring. With the advent of the Second World War Eric’s sense of duty tempted him to consider reducing his stated age and enlisting in the 2nd AIF, but he was too well known in Maryborough to get away with that. However, he was able to serve as a temporary Captain in the role of Area Officer for the 47th Battalion - engaged particularly in recruitment – and as Commander of the 11th Battalion in the Volunteer Defence Corps. In 1942 he was commissioned as a Flying Officer in the RAAF and involved with the Air Training Scheme until 1944, acting as a Flight Lieutenant for some of this period. On 25 March 1933 in Townsville Eric had married Eva Nicholson Ewart – the daughter of accountant William Ewart and his wife Lucinda - and they had two sons, David and Robert. David had a notable career as a dental specialist (both as a practitioner and academic) and as a Senator for Queensland and Federal parliamentarian 1978-1999. In the latter role he pursued a particular interest in foreign affairs and defence issues. Robert pursued a career as an engineer. Eric passed away in Brisbane on 7 January 1974 and his ashes were interred, with Presbyterian rites, at the Mt Thompson Crematorium. • The Australian Sugar Journal, 15 February 1954, pp89, 733-737.